3D buildings on 3D Terrain. Foundations, framing, paving, trees, landscaping, and drainage. Sun studies, energy simulations and views from anywhere. Site design by a P.E. Foundation & Framing by a P.E. 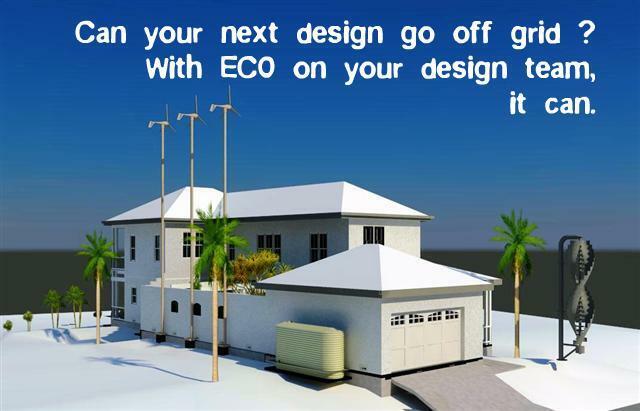 Our 'ECO' name is for sustainable building practices. Our 'TexasEngineer.com' name is just help customers find us. We provide civil and structural engineering in Texas. We offer design consulting services for green building, net zero energy, alternate building systems, and shelter-in-place. We also provide inspections and TDI Wind Storm services. BUILD BETTER: Our 15 year old structural + civil engineering firm provides design, consulting, and plan services so you can build better. BUILD SMARTER: We'll help reduce your project's energy consumption and its environmental impact. We can also improve safety, accessibility, lighting, function, and fun. BUILDER GREENER: Its more than adding super-insulation. We can help you add Electric Vehicle service equipment in your garage, solar array capable roofs, shelter-in-place areas with standby generators, rain water harvesting, recycling and composting stations, and a robotic vegetable garden. SEE B4U BUILD: 3D Virtual Reality Walk-threw, Fly-by, Room Views, Sun Studies, Lighting Studies, & Energy Simulations. Our expert Revit 3D can enhance both design & performance.